Zinovta has created a new style of knife called bolo, that is equipped with a very unique circular blade and provides a number of useful advantages over a straight edged knife. The bolo rolling knife has been designed specifically for slicing, dicing and chopping and its design relieves any stress that may be felt on your wrists when using a traditional knife. Watch the video below to learn more about the inspiration behind the bolo and how its unique design can help you be more efficient in the kitchen. Why a rolling knife? : Great knives do two things very well: feel good in your hand and cut extremely well. 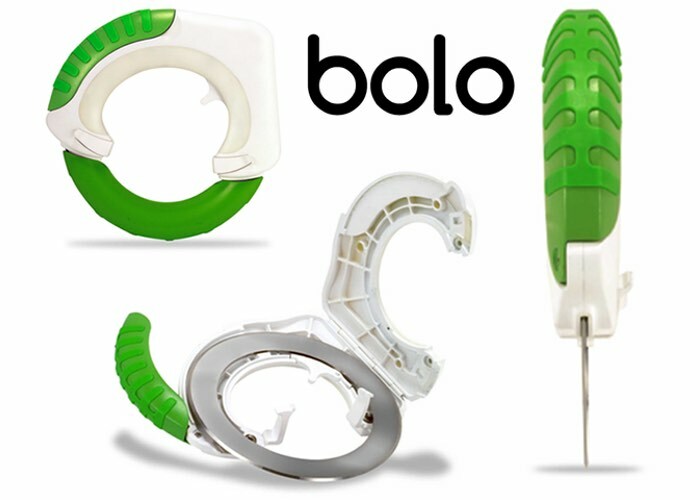 bolo takes this one step further, by making a knife that sits naturally in your hand, and channels the power from your hand and wrist to the blade to make cutting easier than ever before! The bolo project is currently over on the Kickstarter crowd funding website looking to raise $30,000 CAD in pledges to make the jump from concept to production. So if you think bolo is something your cutting and cooking could benefit from, visit the Kickstarter website now to make a pledge from $14 CAD and help bolo become a reality.